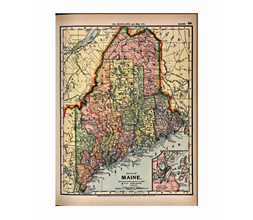 Editable royalty-free map of Maine, ME in vector-graphic online store. 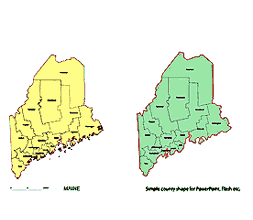 Maine is located in the northeastern portion of the United States in New England, and it adjoins to the northeast by New Brunswick, to the north west by Quebec, Canada, to the east by the Bay of Fundy, to the southeast by the Atlantic Ocean, and to the west by New Hampshire. 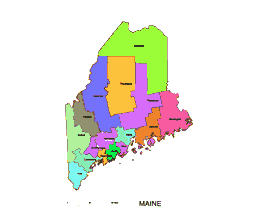 The State of Maine is known for its ruggedly beatutiful coastline, its dense forests, and its countless lakes and mountains. Every summer, millions of tourists flock here to visit the salty seaside villages and beaches and dip into the fresh-aired diversions of the great wilderness. 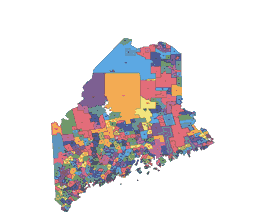 The northern woods of Maine are an area of unmatched wild beauty. It’s home to the state’s highest peak. 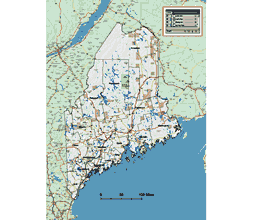 (Mt.Katahdin), the biggest state park (Baxter), and the largest lake (Moosehead). 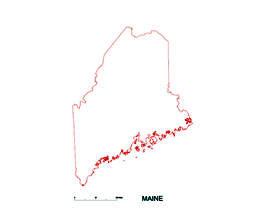 Its year-round residents include heary-soul State of Mainers and a large black bear population in addition to moose, bobcats, and scores of birds. 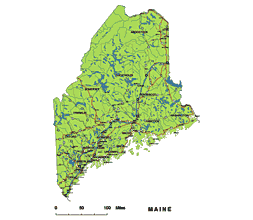 One of Maine’s intensely scenic areas, this park encompasses a large portion of Mt. Desert Island, the Shoodic peninsula on the mainland, and the teeny Isle au Haut. Th Park Loop Road traverses approximately 20 miles up mountains, by the sea, through forests, and past ponds and lakes taking in all the highlights. There ara hiking trails, campgrounds, picnic areas, and places to swim and fish. Maine’s state capital features a museum at Fort Western, constructed in 1754. The statehouse, built with native granite, houses the Maine State Museum. Once a lumber and shipbuilding town, Bangor is now northern Maine’s largest city. See the Bangor Historical Society Museum and consider taking one of the cruises along the Penobscot River. Maine’s largest park, this 200,000 acre wilderness preserve is magnificently scenic. 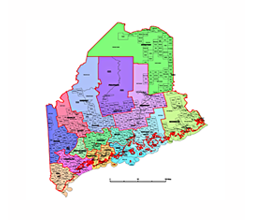 There ara over 150 miles of hiking trails that take you through pine forests, by rivers of rapids, alongside blue lakes, and up mountains-including Mt.Katahdin (5,267 feet), the highest in the state. One of the most popular tourist towns on the Maine coast Boothbay Harbor has an aquarium, a historical museum, Grand Banks Schooner Museum, and a railway museum, plus dozens of shops, restaurants, inns and hotels. Once a small fishing settlement, this oceanfront village has sprouted into a major resort area. There ara several wave-smacked beaches, historical houses, galleries, shops, seafood restaurant and small inns. The state’s largest city is situated on an island-studded bay. Wander around the Old Port Exchange which is an area of old warehouses and other 19th-century buildings that now house restaurants, tavers, and arts and crafts shops. See Wadsworth-Longfellow House. 1755 Tate House. Portland Museum of Art, and The Museum of Portland Headlight. Tour boats sail Casco Bay, and a summer ferry serves Yarmouth and Nova Scotia.